When the flower blooms appear on the squash and pumpkins, I was told you have to pick the flower blooms off or the pumpkins and squash will not form. 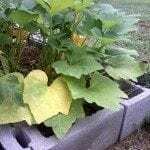 Is this true, or will the pumpkins and squash develop from the flower bloom? Definitely leave the blossoms on. Squash (including pumpkins) have male and female flowers and need both to make squash fruit. Leave all the blossoms on to get fruit, but realize that only female blossoms will produce the fruit.